Step 4 – Do the Maths! It’s all downhill from now, honestly! Compare the zero odds with the market price: if the price on offer for Over 2.5 Goals is above our zero odds value, this is a value back bet. If the price is below zero odds, you may wish to consider laying Over 2.5 Goals at a betting exchange. This price is suggestive of a back bet with strong value in our favour as the market price far outweighs the statistical probability of the outcome. Comparing the returns from the zero odds and the market price, the amount of ‘mathematical advantage’ contained in this bet would be 46.65%. (Expected Return on Investment). The second method of expressing value by looking at true odds in relation to the market odds gives a figure of 21.68%. (Relative Deviation of Implied Probabilities). Go here for the basics of calculating value, and go here to learn exactly how to calculate odds, probabilities, and value in all its forms for profitable long-term betting. In our example, both methods of expressing value produced healthy positive figures making Over 2.5 Goals a definite back bet candidate. The bet would have been more suitable for ‘laying’ if both measures of value had returned healthy negative results. 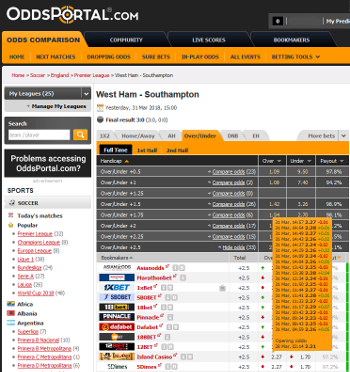 The game finished 3-0 to West Ham and our Over 2.5 Goals bet therefore produced a handsome return! Upon opening the cluster table to check the Over 2.5 Goals bet for value, the whole calculation and decision-making process took less than two minutes. The speed at which it is possible to check games and build a portfolio of value bets for the weekend is one huge advantage of the Cluster Tables. The other huge advantage is that they actually work! Always ensure you use the correct table when recording percentages. It is all too easy to confuse the home and away panels and also the over and under panels if you are analysing several games in a row. And remember to change the team name when looking for the away figures! Once the 2017-18 season is over, please don’t rely on this table for bets in following seasons. 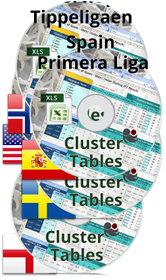 All tables have to be renewed at the end of each season to take into consideration a potentially different set of teams with five complete data sets, and to discard the oldest season’s figures and add the season just finished. Check out our accompanying articles exploring what happened when we applied the same techniques to an entire round of 2016-17 EPL matches here and a round of 2018 U.S.A. M.L.S. 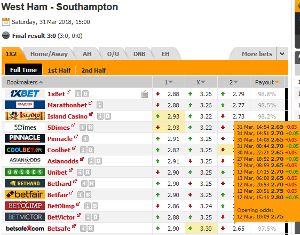 games here – this demonstrates what is possible in single leagues and if every bet is a ‘value’ bet, it naturally follows that the larger the portfolio of bets is, the faster the bank should grow. Buy your portfolio of supporting leagues here. 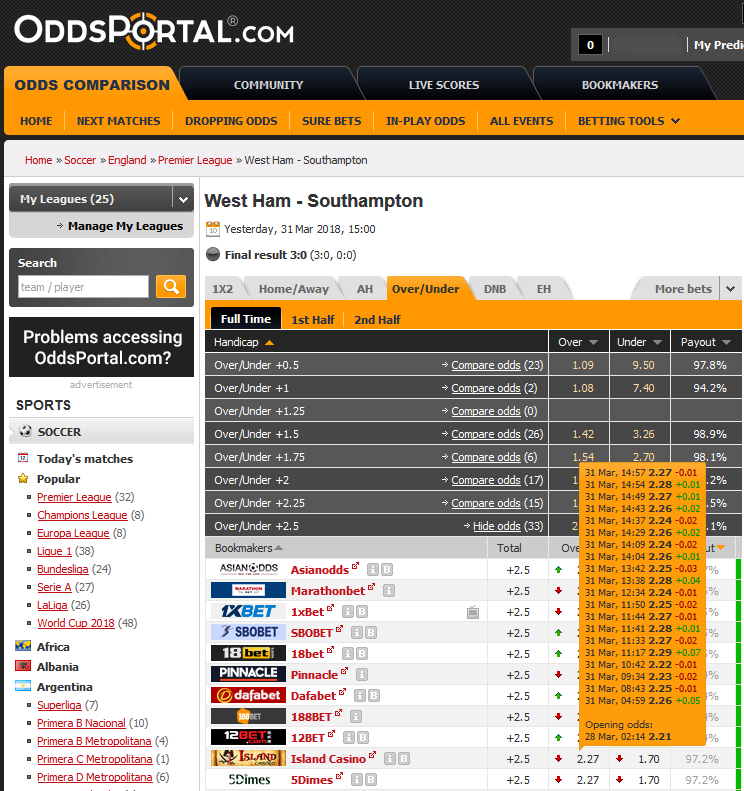 The Oddsportal image in Step 1 shows that West Ham’s price at Betsafe on 12th March at 20:53 (nineteen days before the game) was also 2.90. The screenshot on the left (you’ve got it – just click on it to enlarge in a new tab! 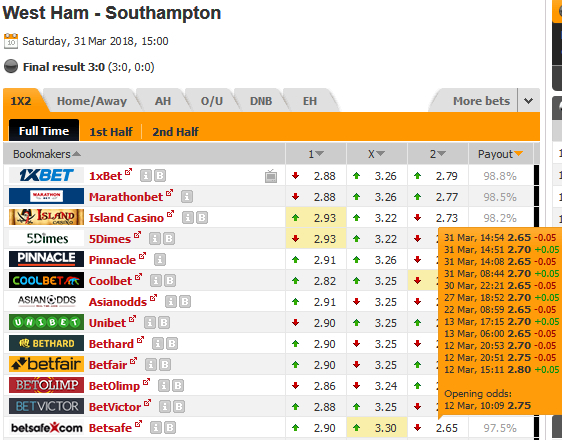 ), shows Betsafe’s away odds throughout the ante post market and you will see that their price for Southampton at exactly the same time, 12th March – 20:53, was 2.70. Had we performed the HO/AO quotient calculation almost three weeks before kick-off, the quotient would have been 2.90 divided by 2.70 = 1.0741 (rounded-up). From the cluster ranges for each team mentioned earlier, you will see that this alternative quotient would have placed the match firmly inside exactly the same clusters, and it would not have mattered which bookmakers were chosen or when, or what the highest market odds for the home or away win were.